The LIS for a POL, like any other clinical application, needs to have the ability to provide security for its data to HIPAA standards and beyond, with protection of PHI of primary concern. This includes a number of areas, from data encryption to controlled user access to auto-log off after a designated period of inactivity, with safeguards against hacking. Any system considered for use where private or sensitive information may be present needs to be designed to meet these and related requirements. [Template fetch failed for https://www.limspec.com/index.php/Template:Specification_POL_S0040_Data_and_Access_Security?action=render: HTTP 500]Data security is an integral characteristic of HealthCloudPOL, and exists on two levels: (1) HealthCloudPOL (the LIS app itself) and (2) our state-of-the-art secure cloud-hosting infrastructure. HealthCloudPOL’s design interacts with the security mechanisms inherent to its SQL Server database. This includes the ability to define individual database logins with encrypted passwords which grant a variety of levels of security on the entire database or individual database objects such as tables and stored procedures. Case-sensitive passwords may be configured to accept defined character types/lengths. 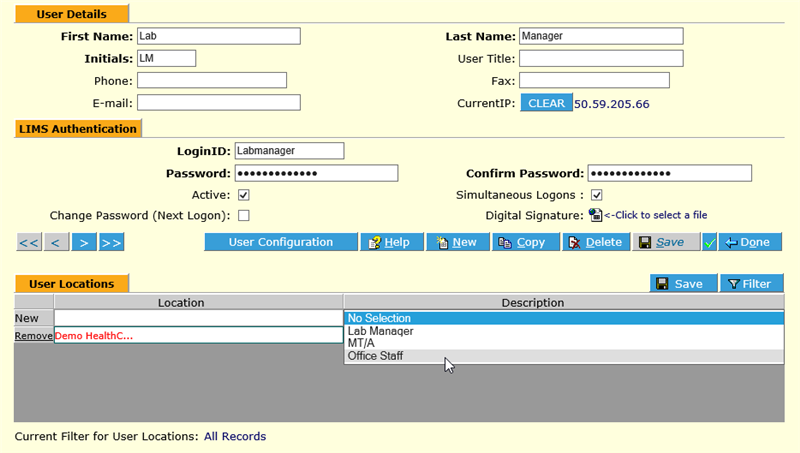 The ELab database may be accessed through the application’s SQL Server login and password security. Its predication on Microsoft IIS includes those inherent security protocols, including SSL encryption. Automatic inactivity logout can be set to a desired length of time. Suspension of a user is set by default after three unsuccessful login attempts. This is configurable by the customer. The system pops up a message to the user, upon their third successive unsuccessful attempt to login, that they have been suspended and need to see the System Administrator. Should a user be inactive for a period of time the system logs them out and the screen displays the message that they have been logged out. Because users are required to login to gain access to the application, all data modifications are documented. Users are also tracked by primary location so that information available to the individual user is also limited to information belonging to the user’s location or laboratory, creating an audit trail fulfilling both standards and regulatory compliance criteria. Additionally, standard access-level profiles are provided for assignment to users, based on job function. All data transfer and management in HealthCloudPOL complies with applicable standards and regulations, including HIPAA, CLIA and 42 CFR part 493/HITECH. HL7 is used for any data transfer, in line with healthcare industry standards. ↑ “HIPAA ‘Protected Health Information’: What Does PHI Include?”. HIPAA ‘Protected Health Information’: What Does PHI Include?. HIPAA.com. http://www.hipaa.com/hipaa-protected-health-information-what-does-phi-include. Retrieved 30 July 2015. ↑ “Horizons: Security”. Magazine. Bio-IT World. http://www.bio-itworld.com/archive/091103/horizons_security.html. Retrieved 3 Aug 2015.